Line 1 is case sensitive. Spelling & punctuation will appear exactly as you entered it on your order. There is a 20 character limit with this sign. Please note, the more characters you request, the smaller the text will be. State comes in uppercase letters. Spelling & punctuation will appear exactly as you entered it on your order. There is a 16 character limit with this sign. Please note, the more characters you request, the smaller the text will be. Add this Vegas style Personalized Man Cave Welcome Metal Sign - Night to your Man Cave. This sturdy Personalized Man Cave Metal Sign is ideal to hang in man cave, garage, office or other special room. Personalize with a name and your home state. Please note that this Vegas style sign is cut to the shape of the actual design and has 4 holes for nails for the sign to be hung. 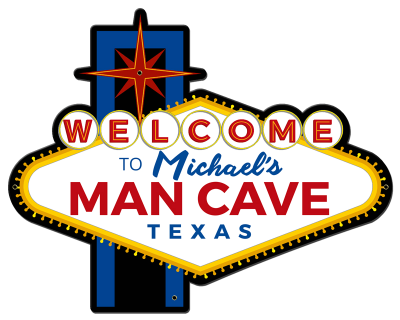 Durable and attractive with a long lasting finish, this Personalized Man Cave Welcome Sign comes in two sizes: 17 in. x 14 in. and 24 in. x 19 in. It is drilled and riveted for easy hanging. Proudly hand made in the USA, is just under 2lbs and made of heavy 20-gauge American steel. Therefore, this is NOT a flimsy sign or cheap thin faux composite wood or plastic sign. A Man Cave Gifts Exclusive!